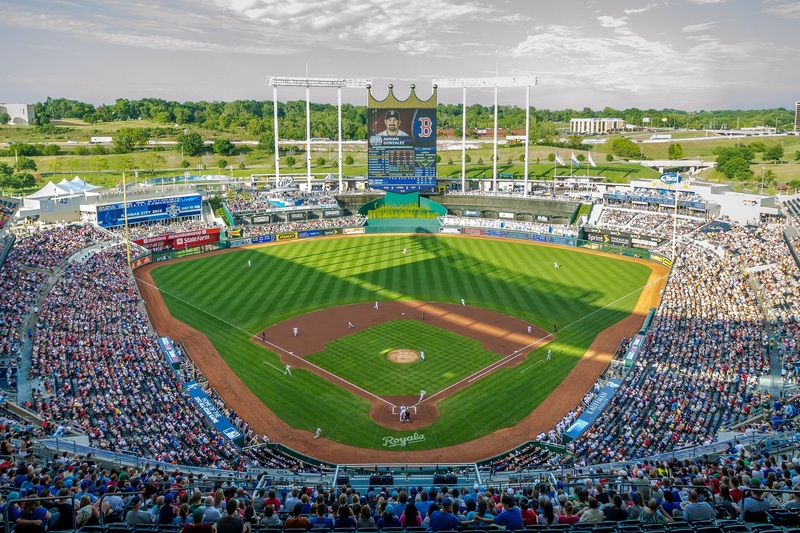 It may be the fourth oldest ballpark in the American League, but the home of the Kansas City Royals has remained one of the most picturquest ballparks in baseball. 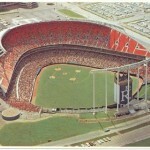 When it opened in 1973 the stadium broke away from the trend of multipurpose stadiums built during this time. 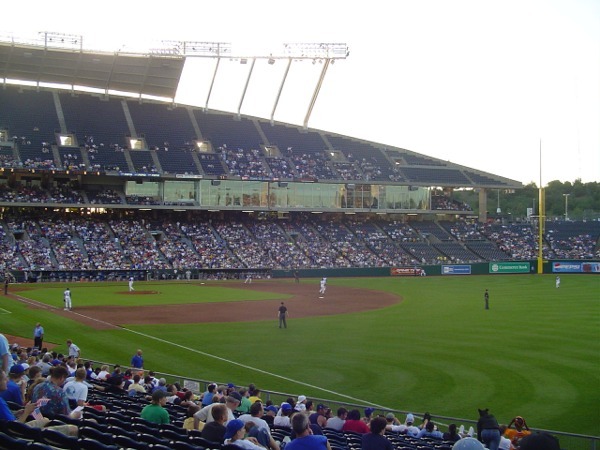 Major League Baseball arrived in Kansas City in 1955 when the Philadelphia Athletics moved to the city and into Kansas City Municipal Stadium. 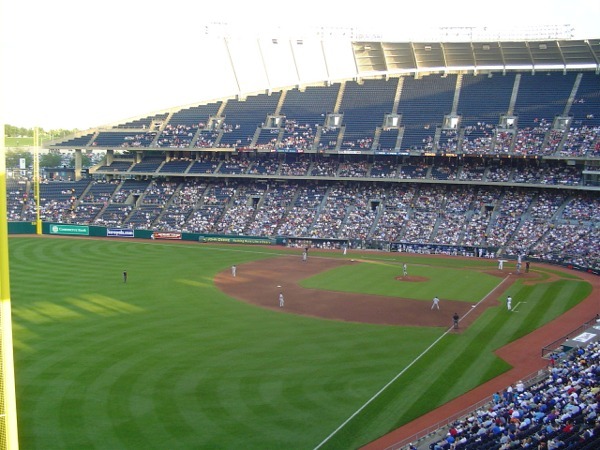 Originally built in 1923, it was rebuilt and expanded for the A’s. 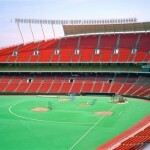 In the early 1960s owner of the A’s Charles Finely began to look to move the team to a new city. 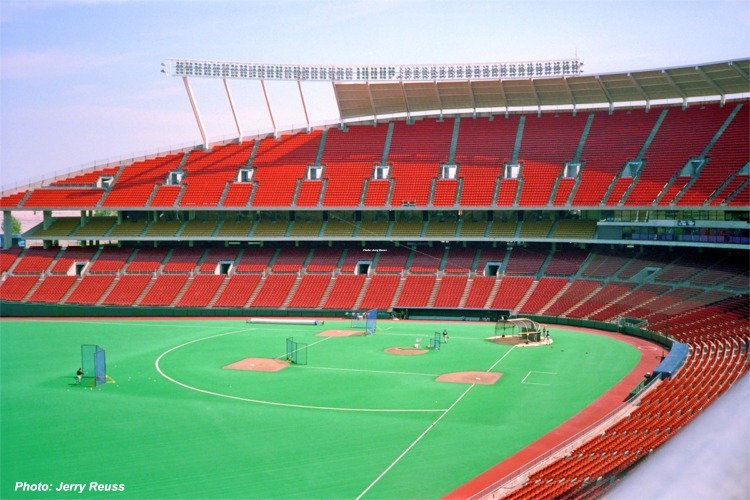 In an effort to keep the team in Kansas City, the Jackson County Sports Complex Authority was established to acquire land, design, construct and funding for a new sports complex for the A’s and the Kansas City Chiefs (NFL) who also shared Municipal Stadium. 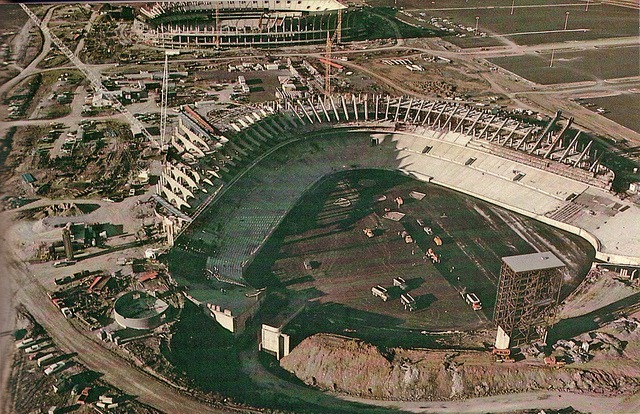 Original plans called for a multi-purpose stadium but were scrapped because of design and seating capacity issues. 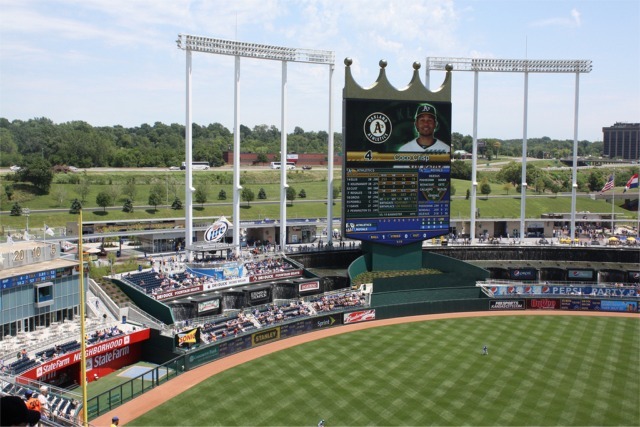 Unlike many other cities that were building multipurpose stadiums at the time, the county decided to build two new stadiums, one for the A’s and one for the Chiefs. 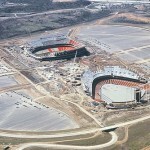 In June 1967 a $102 million bond was issued for construction of two sports stadiums. However, the A’s left for Oakland, CA in October 1967, as Charles Finely did not want to wait for a new stadium to be constructed. Hal McRae hits 54 doubles in 1977. 2009 CY Young Award winner Zack Greinke. George Brett bats .390 in 1980. 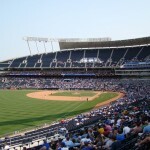 After the A’s left, United States Senator Stuart Symington demanded a new franchise for Kansas City or he would introduce legislation to remove baseball’s antitrust exemption. 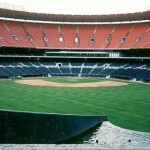 During baseball’s winter meetings in 1967, MLB decided to expand by four teams that would begin playing in 1971. 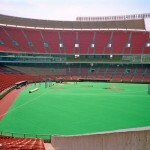 However, pressure from Symington and other officials led to MLB allow the expansion franchises to begin playing in 1969. 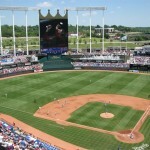 The new club in Kansas City was named the Royals. 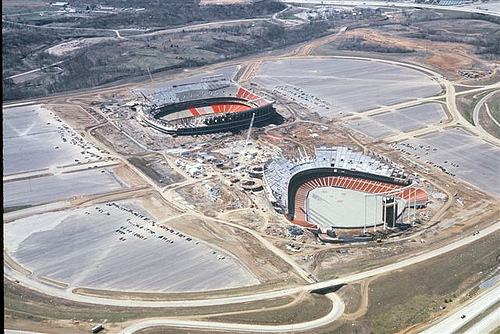 Construction on the Truman Sports Complex that included the Royals stadium and the Chiefs stadium, Arrowhead Stadium, began on July 11, 1968. 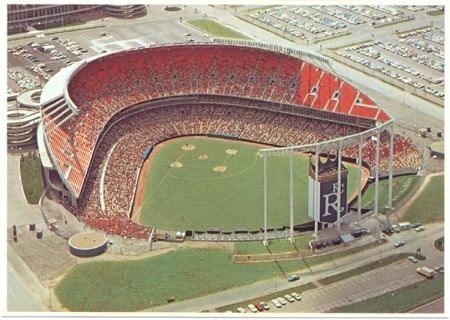 Originally known as Royals Stadium, the Royals played their first game at the stadium on April 10, 1973. 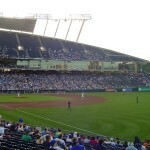 Royals Stadium was very colorful with 40,793 seats, all facing second base and arranged in three tiers with maroon, gold and orange seats. 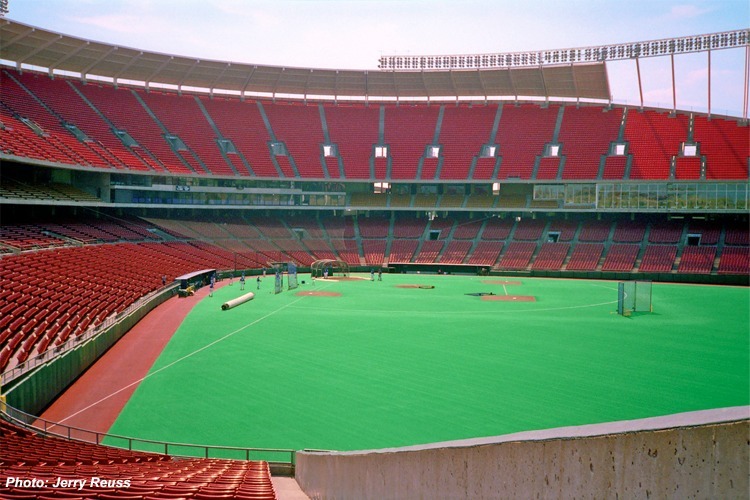 It was the American League’s first ballpark with Astroturf as the playing surface. 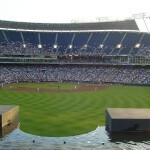 The most unique feature of the stadium are the water fountains beyond the outfield fence as Kansas City is known as the City of Fountains. 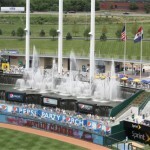 The fountains stretch 322 feet horizontally and have a 10 foot high waterfall that descends from an upper cascade pool that serves as a background for two water fountain pools. 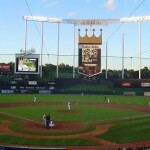 A 12 story scoreboard, in the shape of the Royals’ crest is located beyond the centerfield fence. 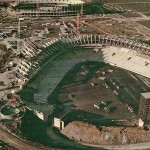 Until the 1990s there were few changes to the stadium. 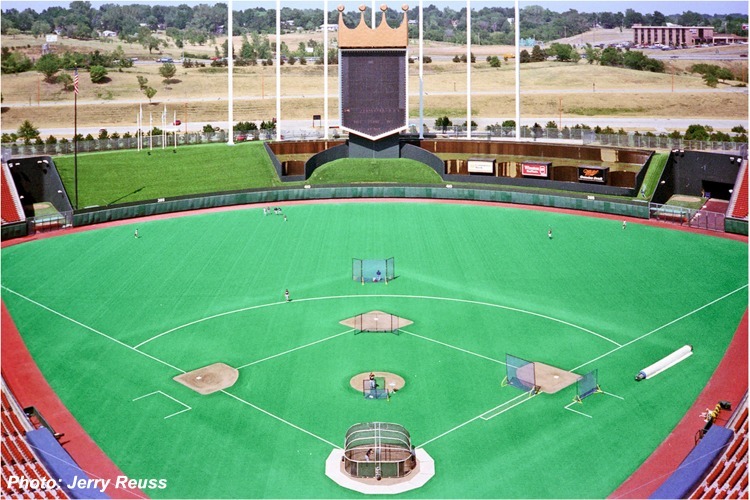 In 1990, a 30-by-40 foot Sony JumboTron video board was installed in left-center field. 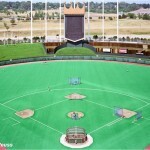 The stadium was renamed in honor of Ewing Kauffman in 1993 and two seasons later the Astroturf was replaced with grass. 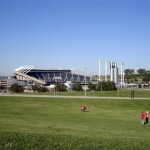 After the 1998 season Kauffman Stadium was given a full makeover. 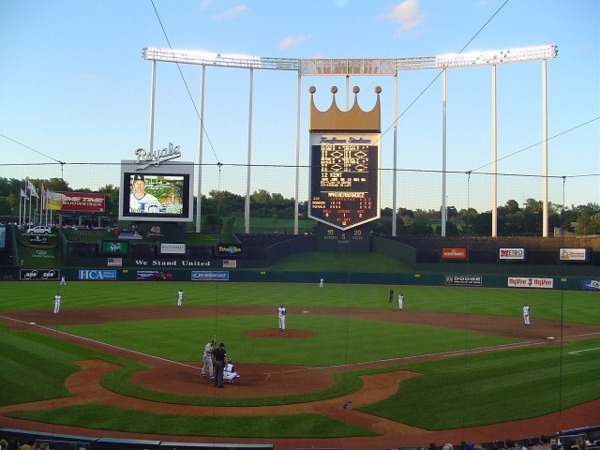 The stadium renovation project included the addition of Crown Seats, Dugout Suites, new clubhouses and an exclusive restaurant and lounge known as the Crown Club. 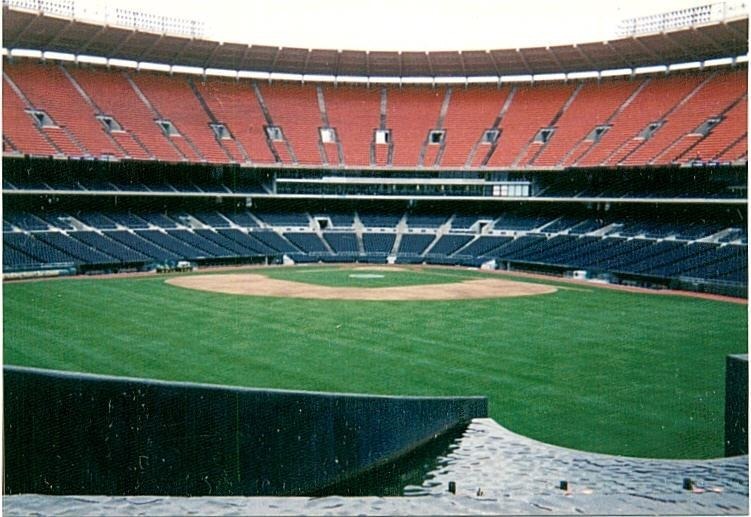 All of the orange seats throughout the stadium were replaced by blue seats. 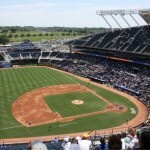 In an effort to maintain its status as one of the best stadiums in the big leagues, the Royals announced in 2007 that they would embark on a two year, $256 million renovation to Kauffman Stadium. 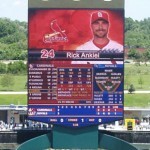 Phase I of the renovation project completed by Opening Day 2008 included new bullpens perpendicular to the field, expansion of the seating in the Crown Club and Dugout Suites, and a LED auxiliary LED scoreboard in the left field wall. 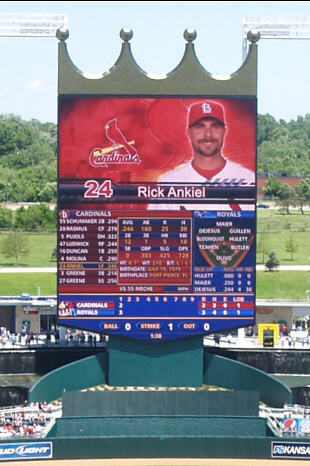 The most apparent change was the replacement of the original crown scoreboard in centerfield with a new 150′ by 40′ high definition video/scoreboard. 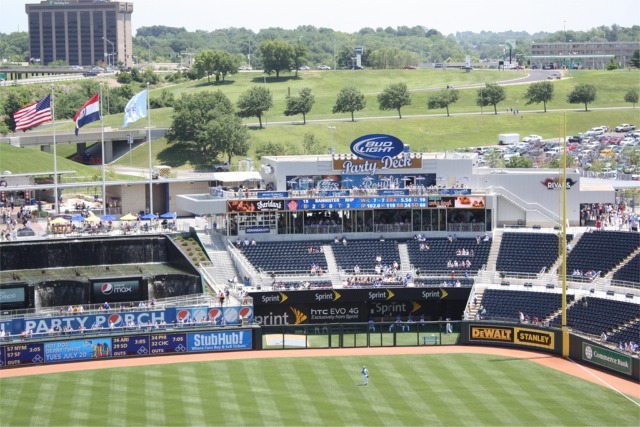 Renovation work continued on to the dugout level concourse, exterior work to widen concourses on all levels and on the outfield plaza to connect the entire ballpark. 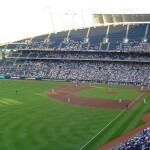 The renovation project was completed by Opening Day 2009. 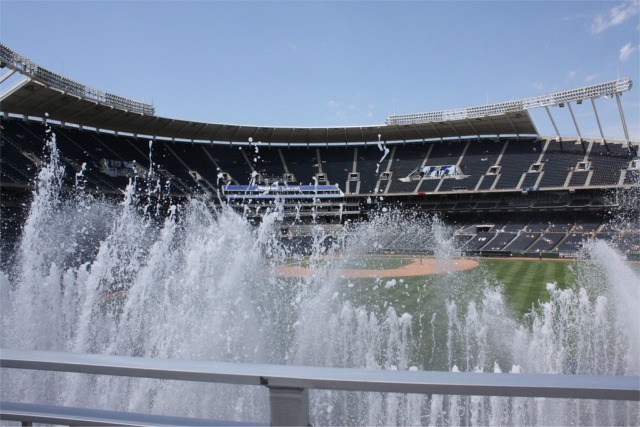 Additional improvements to Kauffman Stadium included new fountain view terrace seats in the outfield, widened concourses on all three levels and an outfield concourse that allows fans to walk 360 degrees around the stadium. 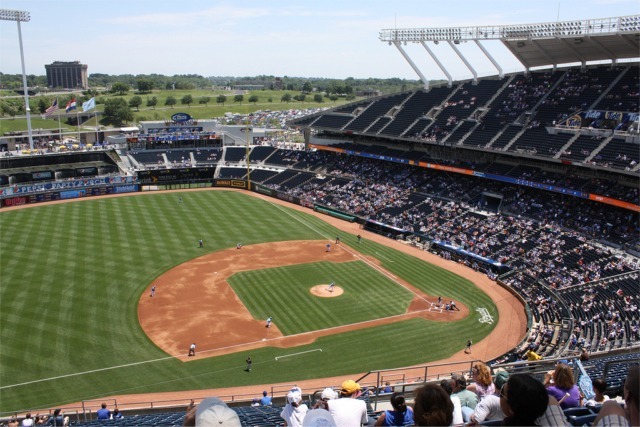 There are a host of attractions for fans to check out when visiting Royals Stadium. 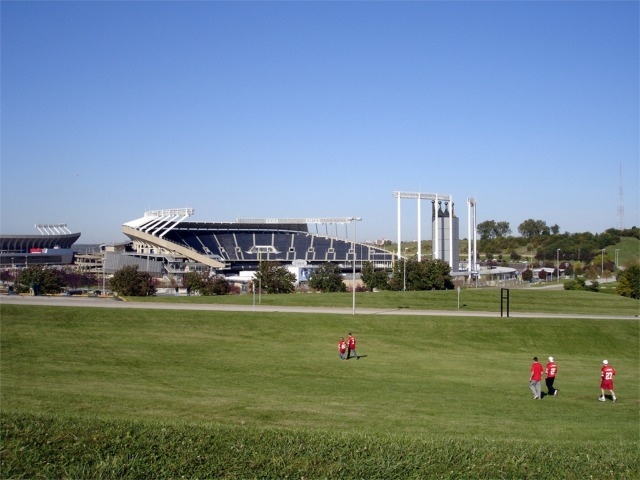 This includes a kids’ area known as “the Little K,” the Taste of KC, a right field sports bar themed restaurant, and the new Royals Hall of Fame in left field. 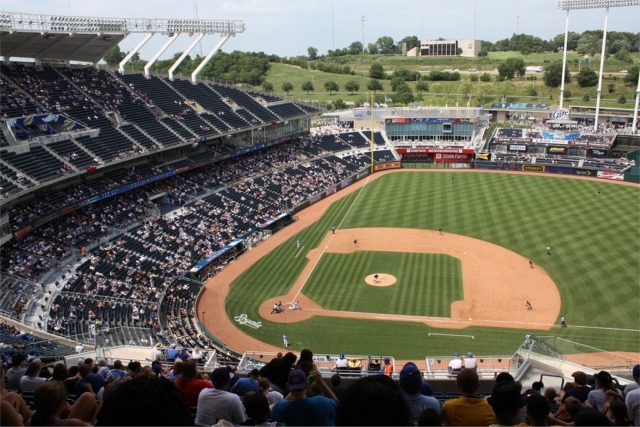 Because of these renovations, Kauffman Stadium’s seating capacity is now 38,177. 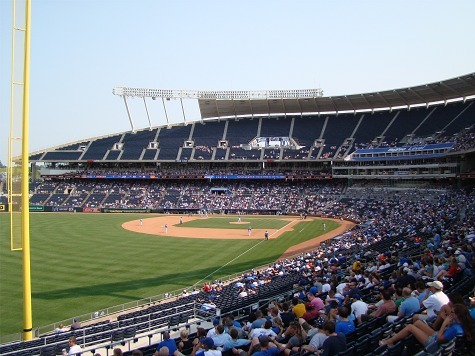 Today, fans from Missouri, Kansas and other states come to Kauffman Stadium to enjoy Kansas City Royals baseball, views of the fountains beyond the outfield fence and views of the Midwest landscape. 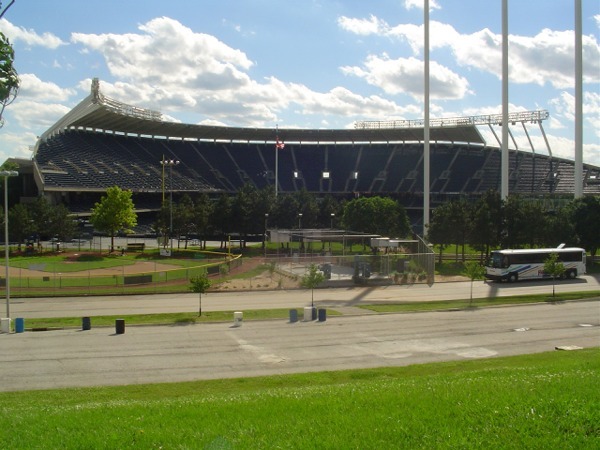 Plentiful parking surrounds the stadium and fans can enter Kauffman Stadium through many locations. 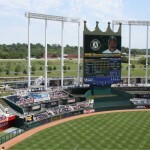 Once inside, circular ramps and escalators take fans to the club and upper levels. Upon entering, fans are on the main concourse of the stadium. 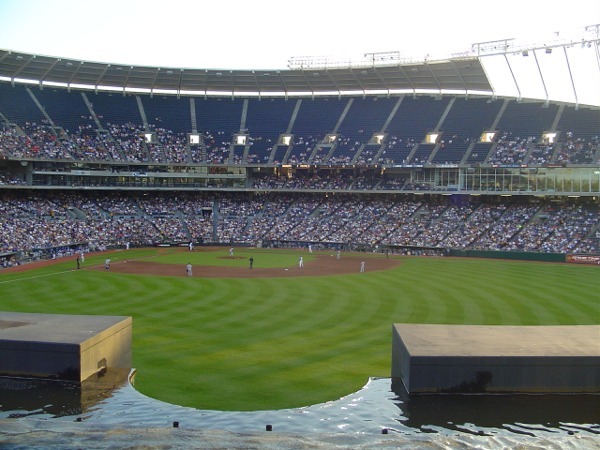 To access the field and dugout box seats fans must either walk through the dugout or field plaza seats or go down the circular ramps. 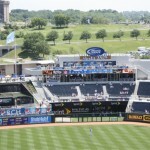 Numerous concessions and merchandise stands are located along the concourses. 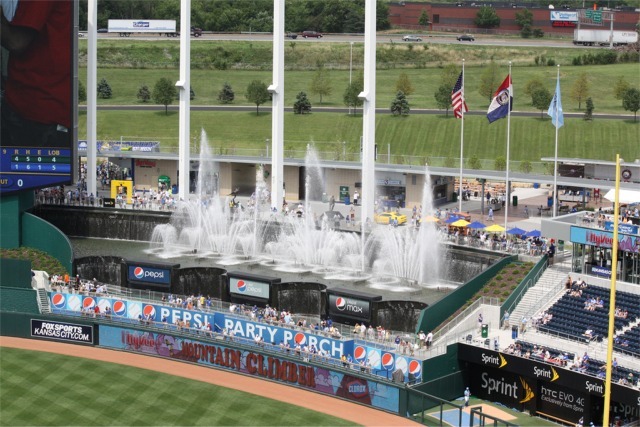 Anywhere throughout the stadium fans can enjoy the view of the fountains that are beyond the right field fence. 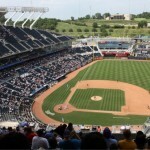 On a hot day fans can stand beyond the ones in right field to cool down. 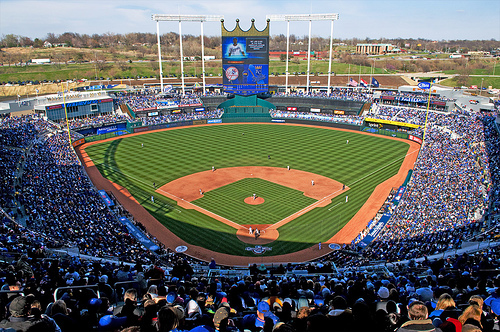 Although today it is one of the oldest stadiums in baseball, it remains one of the best in the sport. 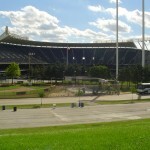 For nearly three decades Royals fans suffered through multiple losing seasons. 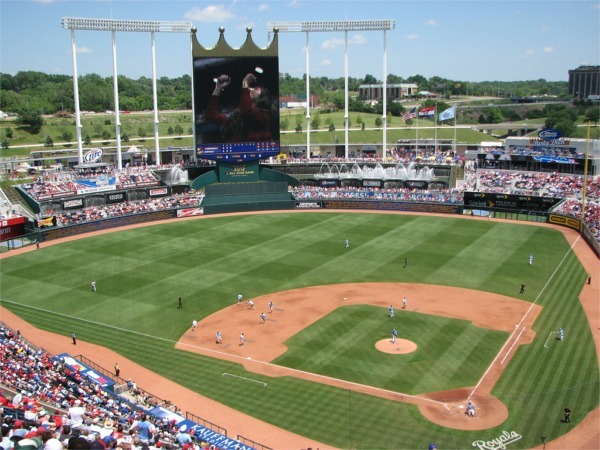 For the first time since 1985, playoff baseball returned to Kauffman Stadium in 2014 as the Royals won the American League Championship. 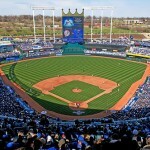 Led by stars including Mike Moustakas and Wade Davis the Royals made back to back appearance in the World Series, winning the 2015 World Series over the New York Mets.